When I first got Freedom he used to weave so badly that the whole trailer would shake. I remember stopping for food once and realized that people in the parking lot must’ve though I had a wild animal in there! What will your horse remember the next time you load? Source: The Trailer Isn’t the Problem. I highly recommend that you click through and read the excellent post from Anna Blake, who manages to get to the crux of the issue in just one sentence. 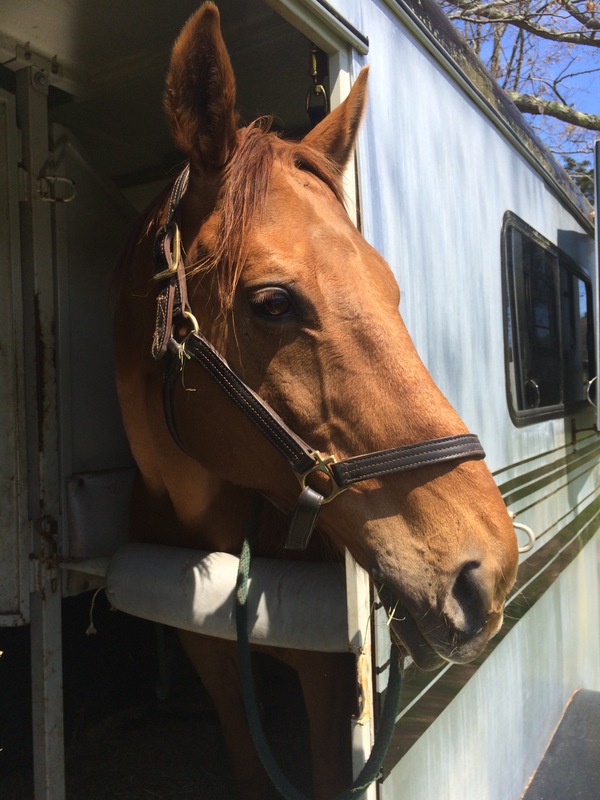 Her excellent post got me thinking about the trailering issues I’ve had with my horses (usually at the beginning or our relationship). My Trakehner, Kroni, once refused to get on a trailer to the point where we missed a competition! He was always a little sticky until I bought a new, bigger trailer that he considered worth getting on. Until then, I had some, shall we say, interesting loading experiences. The worst were the ones when people “helped”. They helped by bringing brooms, whips and lunge lines, all of which made him more determined not to step foot into a box that was surrounded by so many frightening things. I remember after one “helping” experience, I had pretty much decided we would never leave the property again. In his case, I think my original trailer (which had been perfect for my QH) just wasn’t big enough. He wasn’t afraid. He just wasn’t interested. He perked up considerably when I got my new trailer and self loaded like a champ. One year, at the last hunt of the season, he fell in the trailer on the way home. I heard some kicking in the back, but not a lot. I was about 10 minutes from home and when I opened my trailer, he wasn’t standing on the the left where I’d loaded him. There was only a dangling halter. He had gone under the divider and was standing, shaking like a leaf, on the right side of the trailer. Remarkably, he was uninjured. Even more remarkably, the next time I asked him to load — about 2 months later — he walked on like a champ. Freedom was a nervous rider. The day I picked him up, he walked on okay, but he was weaving so violently that when the trailer wasn’t moving, it shook like I had a pair of fighting elephants inside. When we stopped for lunch I could see people staring out the window of the restaurant in alarm, wondering what was going on in there. He got better when traveling with a friend. However, the first time I loaded him by himself, he walked on fine, and then panicked. I thought there was a good chance he’d try to jump out over the front bar, so I got in and started driving. He was fine when the trailer was moving, but since we were on our way to a hunt and I hadn’t been smart enough to pack everything before I loaded, I had to keep driving back so I could jump out grab something and start driving before he flipped out again. After a good long hunt, he got on the trailer and stood pretty happily during the tailgate tea. All of a sudden the trailer (and it’s full hay bag) was looking pretty good. He wasn’t perfect after that, but he has continued to get better. Now he travels by himself like a pro and walks on without a fuss. The only thing he still won’t tolerate, is if he’s traveling with a friend and that horse gets off first. But he’s come so far that I don’t ask him to do that. And the patient horse award goes to . . .
My OTTB would load well but he couldn’t stand being in there, especially if we weren’t moving. When I first brought him home I had shipping boots on him but he managed to tear up the skin above his hocks. I had heard him banging around in there, pulled over to check on him, saw nothing but him just standing there so drove on. I still can’t figure out what he caught his legs on because the divider is low and tall for him to catch on it. I found I had to unload him as soon as we got wherever we were going or he’d try to come out through the escape door. He got better with time but I never could figure out what the problem in the trailer was. They sure are good at finding ways to hurt themselves!